Link of the Week: Books to Movies – Lost in Translation? Finding out one of your favorite books is going to be made into a movie is both incredibly exciting and increasingly nerve-wracking, sort of like the first day of high school. Going to see that movie almost becomes a question of life or death. Will I forget what the characters in my head looked like? Are they going to ruin the ending? What ridiculous scenes are they going to add that do nothing for the book’s original plot? It is hard for a book lover to see his precious story turned on its head and spun around, imagined by some totally different person. However, turning a successful book into a movie is like giving the book another chance to see the light of day, a chance for a new audience to uncover its pages. Of course, its also a great way for the book to earn a couple more dollar signs. Most of us probably aren’t the biggest fans of the movie companion books adorned with the flashy movie poster covers. Yet, for some readers, this is how they will be able to identify the book. Marketing for movies is intense and in-your-face, but most wouldn’t even know that a movie was based on a book until they see that movie poster cover on a front table in the bookstore; that is, unless the movie is The Hunger Games or Harry Potter. The idea of turning one successful media into another is both troubling and fulfilling. Stories have always been told in different ways: from the spoken word to plays, and from radio to television. The best part about this is that the adaptations are different and new. It’s true that as fans of a certain book, we want to see that book brought to life in its authentic form. Nonetheless, a book is a book and a movie is a movie. We can only hope that the movie will stay genuine to the book’s heart and to its original fans. Of course, there are always those added scenes that we can’t but help wonder if the book’s words were somehow “lost in translation.” The Huffington Post compiled a great list here. If you’re a fan of The Lord of the Rings, you might remember the scene in The Two Towers movie where Aragorn seems to die when he falls off a cliff. This, in fact, did not happen in the books. In the first movie adaptation of the charming book Charlie and the Chocolate Factory, you might remember the traumatizing tunnel-boat scene that indeed was not in the book. However, it may have been an even greater stretch in the second adaptation with Johnny Depp in which Willy Wonka’s father was a dentist. I prefer the Johnny Depp version because I liked the added backstory. Some may be a little more wary of the Harry Potter movies when it comes to accurate book depictions. Sure, they’re wonderful movies, but myself and others included might agree, why did they change the one-on-one battle scene between Harry and Voldemort? Or was that just how it had to be for the movie? Do you have a favorite and least favorite book-turned-movie? 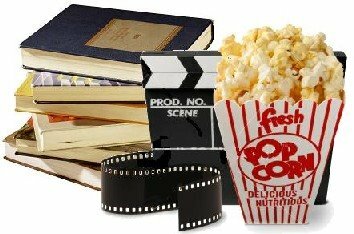 The road is rough for book lovers; but if the movie gives us a chance to look into the minds of the characters once again, then hand me the popcorn and turn down the lights. Let’s go see the show.